Peerless faucets are usually quite easy to repair. Many other faucets tend to have difficult to repair problems, like stripped stems or corroded screws. Peerless faucets on the other hand are designed to be easy to service and maintain. Note: Peerless faucets and Delta faucets are made by the same company. The troubleshooting tips on this page will also work for Delta faucets. Though these repairs are focused on kitchen faucets, most of these repairs will also work for peerless bathtub faucets. Question: What Do I Do if the Faucet is Leaking? If your faucet is leaking, there could be a number of possible causes. The most common and easiest to fix is a loose adjusting ring. To fix the leak, start by turning off the shut-off valve under your sink. Loosen the screw in the middle of the handle. Carefully remove the screw and set it aside. Take the dome top off. Once the top is off, you’ll see a threaded ring underneath. The ring will have several notches on it. Tighten this ring. This should stop most leaks. Replace the dome and see if it still leaks. If the leak persists, you’ll likely have to replace the ball assembly or the cam & packing. Question: What Do I Do if Water is Leaking from the Spout? A leaky spout is a common problem. It’s not difficult, though not necessarily easy to fix. To stop the leak, you’ll need to replace the springs and seats. To get started, turn off the water supply. Plug the sink, as you don’t want small parts falling down the drain. Use an Allen wrench to loosen the handle. If the handle has knobs, you may have to pry off the handle tip (button) and unscrew the screw underneath. Then, take the handle off. Unscrew the nut underneath the handle. Then, using pliers lift the stem out of the socket. Now use an unfolded paper clip or other small tool to take out the spring and seat. Gently clean the area with a cloth, and then place the new spring and seat back in. Make sure you face the tabs on the stem towards the slots on the body. Then follow these steps in reverse to put the faucet back together. Repeat for the other handle if it also leaks. Question: My Kitchen Spout Leaks Whenever I Use the Vegetable Spray. How Do I Fix It? This is usually caused by a problem with the diverter assembly, which is located in the middle of the faucet, beneath the cover. Here’s how to fix it. For Single-Handle Sinks. Turn off the water supply. Cover sink opening so nothing falls in. If you have a model without a screw, turn the spout and pull upwards gently to take it off. If you have a model with a screw, remove the screw, then pull the spout up and out. Remove the screw holding the diverter assembly in place. Insert a screwdriver and pry the divider assembly out. Use a flashlight to look inside and look for dirt, small objects or other debris in the divider assembly. Use your screwdriver to scrape out anything that’s stuck. Soak the divider assembly in a solution of half water, half vinegar for 2 hours. This will deep clean the divider assembly. Reassemble the faucet. If it still leaks, you may have to replace to divider assembly. For Two-Handle Sinks. Turn off the water supply. Cover sink opening so nothing falls in. Take off the spout nut (the top of the sink, in the middle.) You may be able to remove it with your hand. If it’s screwed on too tightly, cover the nut with a cloth, and then unscrew it with an Allen wrench. Avoid direct wrench-to-surface contact to avoid damage to the polish. Using a screwdriver, unscrew the diverter from the rest of the faucet. Place it in a solution of half water and half vinegar. Swish it around to rinse out any debris inside the faucet. Then leave it in the solution for two hours. Reassemble the faucet after letting the diverter assembly dry. If the leak persists, you may need to replace the diverter assembly. Question: Even After Turning Off the Water, it Drips for a Minute. Is That OK? Yes, that’s perfectly okay. The hose and the aerator (basically your piping system) needs a little bit of time to drain after turning off the faucet. This is completely normal. Question: How Do I Stop a Leak Behind My Shower Wall? Repairing a leak behind a wall is both difficult and dangerous. We recommend that you shut off the water supply to the shower, and then call a professional plumber immediately. While most faucet issues can be repaired with good instruction and a little bit of time, this is one repair that we don’t recommend doing. Author Bio – This guest post is written by Brett Thomas working for Peerless specializing in offering affordable kitchen faucets and bathroom faucets with proven design. 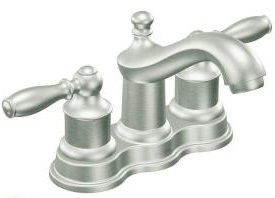 If you’re on the lookout for some quality faucets for bathtubs, lavatory or kitchen sinks don’t forget to check out plumbersstock today.